Dhaka, Aug 20 (Just News): Terming the recent students’ demonstration a juvenile revolt or a popular explosion, president of Communist Party of Bangladesh (CPB) Mujaheedul Islam has emphasised the relevance of change in restructuring the state. “We’ve witnessed an explosion… Change is what is necessary.. And the students demonstrating for safe roads show change is possible. It’s opening of a horizon,” Selim, also a former student leader, said in an exclusive interview with Prothom Alo. On the joint actions of the police and ruling party-backed Chhatra League activists on the streets to quell the students’ protests, he observed that when it is not possible to ensure stay in power of a regime, it is inevitable that the government resorts to force by using the state machinery to cling on to power. Asked about the status of the media, the election commission, the judiciary, and other constitutional bodies, Selim expressed his conviction that all of them are sandwiched, under attack and about to be ruined. He also feels that fair elections would not be possible under the current system, given the records of city corporation elections in recent times. Saying that the left parties his party is aligned with might join polls or boycott it depending on the next political course, the CPB leader insisted that the call of the day is to organise strong, popular demonstration. “Many things including proportional representation can be done for fair elections… but election under the present government, as is referred to, is unconstitutional,” he said arguing that the election commission is supposed to be given authority to enforce all executive powers during the holding of the general elections. So, he added, under the circumstances whoever is the prime minister no fair ballot is possible in the country. “It is not possible to attain a noble objective by means of dishonest acts,” he said about the unhealthy competition in power politics. About the ruling Awami League general secretary Obaidul Quader’s recent meeting with him at his party office, Selim said he did not discuss anything about political alignment with the left parties, knowing full well that CPB was trying to forge an alliance of left and progressive parties outside of the opposition Bangladesh Nationalist Party and of the AL-led 14-party combine. “We oppose the newer version of the BNP-Jamaat rule,” he said dismissing the possibility of the alliance of the left parties with the AL unlike such partnership in the past. He also called the AL and the BNP the like-minded parties in terms of policies, ideology and social status. The left leader the AL had lost its character defined during Maulana Bhasani’s leadership, and redefined by Bangabandhu Sheikh Muhibur Rahman after Suhrawardy’s shifting. “The Awami League under Bangabandhu was left-leaning but it has gone to the middle path of the rightist bloc,” he pointed out. 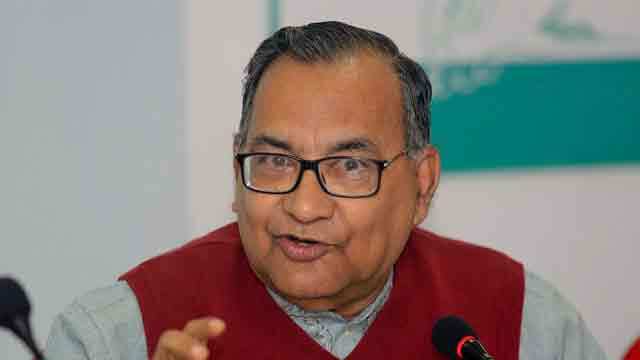 “Earlier the Awami League bore the sentiment of the middle class, but now it has been transformed into lumpen, class of the rich [who loot public resources],” he said. Asked why the government did not take up the issue of listing of 4 million people as “Bangladeshis” with the Indian government, the left leader said, “This is because of opportunistic stance. Not national interests but staying in power is the priority… The government’s hands are tied and it has no backbone because the prime minister knows it does not depend on the people whether she would stay in power,” he added. Mujahidul Islam Selim also rejected the criticism that the left parties have failed to garner public support in favour of their politics. “The left parties are in the front of the demonstrations - for protecting national resources, the Sundarbans, against sexual oppression, for garment workers and Ganajagaran Mancha [Shahbagh-based movement],” he said adding that they had just failed to transform such support into votes.